The Madison Scouts, Cavaliers and Gold all recently revealed the titles of their 2015 productions. The Academy's "Meet the Academy" event on Saturday, April 25, in Gilbert, Arizona, will give you a behind-the-scenes look at the corps as it get ready to make its 2015 debut. Bluecoats reported that they will play a piece of music by Belgian instrumental progressive ensemble Univers Zero as part of the corps' 2015 competitive production. The piece called "Dense" is said by Bluecoats visual designer Jon Vanderkolff to be "dark and aggressive, yet accessible. It's an inspired piece of music that creates fantastic visual imagery. " Boston Crusaders released a teaser video hinting at what the corps will be playing in football stadiums across the country this summer. Carolina Crown wished good luck to all of its percussionists competing at the WGI World Championships this weekend in Dayton, Ohio. The Cavaliers' recently announced 2015 production, "Game On," will feature "aggressively entertaining and emotional" musical works by Debussy, Zimmer/Newton Howard, and Peter Graham. Don't miss Crossmen's Spring Cleaning Sale where discounted merchandise starts at just $5. 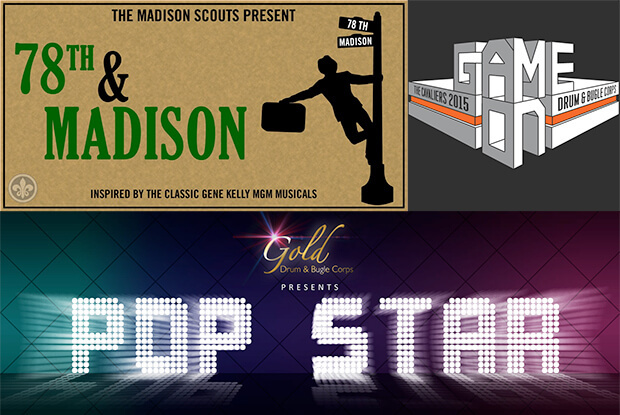 Gold's 2015 competitive production will be called "Pop Star." "It's cool, contemporary, and going to be a ton of fun for the 2015 cast to perform," Gold Program Director Donald Flaherty said. Jersey Surf members are featured performers in a brand new music video by Actress Janina Gavankar. The tune is a drum corps-infused cover of "Don't Look Down" by Dutch DJ Martin Garrix. Madison Scouts announced the title of their 2015 production "78th & Madison," which is said to be inspired by classic MGM musicals starring Gene Kelly. The Mandarins are mourning the loss of a 2008 percussion alum, who was killed in a car accident Tuesday on her way to a bicycle race in Highland, California. Oregon Crusaders' 2015 "Leap!" dinner and auction benefit will take place on Saturday, April 18, in Portland. Registration is now open for Phantom Regiment's summer series of educational camps for students. 2015 offerings will take place in Illinois, Ohio, Louisiana and Maryland. Check out this "drum cam" footage of the Vanguard Winter Percussion ensemble. The group is competing this weekend at the WGI World Championships in Dayton, Ohio. In a new partnership, Monster Oil, LLC will supply Spirit of Atlanta's brass section with valve oil during the corps' 2015 summer tour. Troopers revealed the names of the corps' 2015 horn sergeant and brass section leaders.